Harford County Public Library CEO Mary Hastler considers herself a bit of a techie, leading Harford County to become the first library system in the country to offer free 3-D printing to customers. In her purse, Hastler carries the first “coin” the library printed using the 3-D printer. The library has printed 600 of them featuring the international logo for libraries on one side, and the American Library Association is adding their logo on the back. The coins are being distributed to members of Congress along with information about the importance of libraries. Hastler also carries a Merge Cube (www.mergecube.com) which is an augmented and virtual reality cube that works with her iPhone. There are a variety of apps that can interact with the cube. It can display a fire, castle or there are games you can add to the cube, too. She uses it to demonstrate some of what the library can do in that area. She purchased some as gifts for people this year. 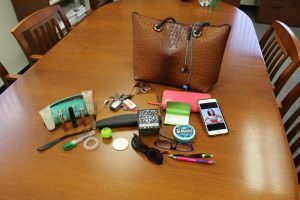 It’s a good thing Hastler’s purse is so big, because she carries items for work. Besides things such as the coin and cube, she also has lip balm in a ball the library is currently handing out as a promotion and a pen that promotes the library’s winter program. Her phone even has a photo of her head on Lynda Carter’s body as Wonder Woman that is being used for the library’s fairy tale and superhero festival. 11. “Coins” that were made for the American Library Association Washington office. Hastler said 600 coins were printed using the library’s 3-D printer to distribute to all the members of Congress.